The Book: While for the most part I was pretty active on my Maine vacation (swimming, hiking, kayaking, a six-mile road race), I definitely overindulged. It’s hard not to when you’re surrounded by good beer, red wine, hearty family dinners, grilled burgers, ice cream sundaes and the like. But, for now at least, vacation is over, and it’s time to get back to a more virtuous eating routine. To help me accomplish that, I’m glad that I have a copy of Diana Henry’s newest book, A Change of Appetite. I love Diana’s books, and while this one, which is focused on healthy but still flavorful and balanced eating, is a radical departure from the likes of Roast Figs Sugar Snow (a book populated mainly by cream and cheese filled winter dishes – you can read my review here), it still has all the characteristics of her cooking that first attracted me to it: internationally inspired, seasonally focused, and full of intense flavors. Reading Diana’s intro, I identified with many of the questions and concerns that she has struggled with as she has tried to find more balance in the food she prepares and eats. I’m glad she ended up where she did, since this book has loads of flavor-forward recipes in it that she has developed along her journey to healthy eating – you could cook healthy breakfasts, lunches, and dinners from this book for a year without getting bored. The recipes pull heavily from Asian, Middle-Eastern, and Scandanivian traditions, and are very seasonally driven. Many recipes are what I describe as “bowl food” – a mix of seasonal foods tied together by a similar spicing or flavor profile, and when combined, make a complete and wholesome meal. I already cook this way quite a bit, so it’s not a book where I find page after page of fresh inspiration, but there’s still plenty here to get my creative juices flowing. Diana’s narrative voice is strong, and she stops frequently to share thoughts on hot-button health issues, like fad diets, the importance of breakfast, and the restorative power of homemade broth. Last but not least, the book and photos have a light, clean feeling, complimenting the overall idea nicely. The pictures are all about the food, and have an uncluttered style that I really enjoy (and lots of jealousy-inducing stoneware). 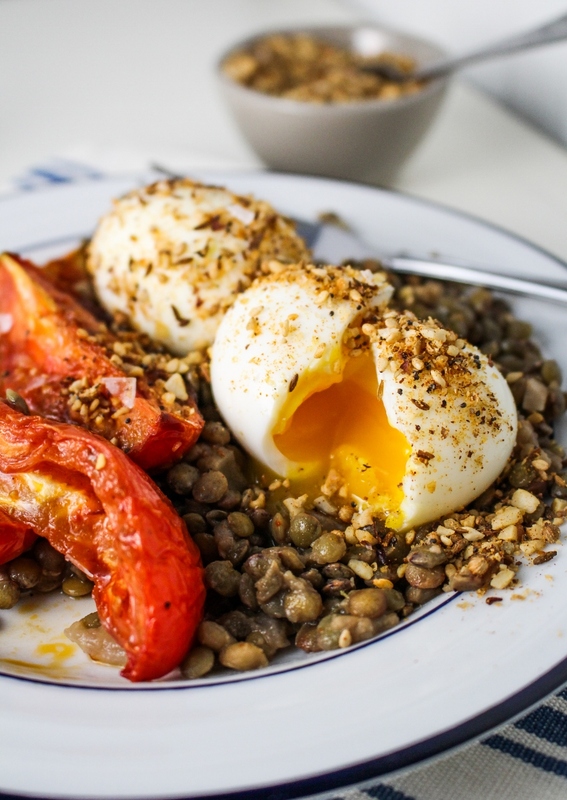 The Food: Although there are plenty of enticing recipes in the summer section of A Change of Appettite, I couldn’t resist making the lentil, roasted tomato, and dukka-crumbed egg recipe in the fall section. While I’m actually not a huge fun of eating fresh tomatoes raw, I love roasted tomatoes, especially in high tomato season. And these roasted tomatoes, drizzled in a spicy harissa olive oil and cooked until sweet and caramelized, are some of the best I’ve ever had. 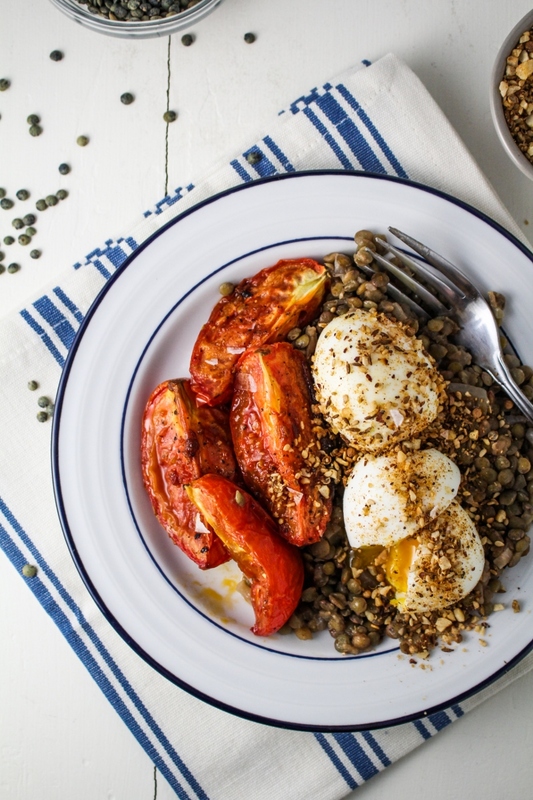 In addition to the tomatoes, there are three other separate parts to this recipe: soft-boiled eggs, sauteed lentils, and dukka, a spiced seed and nut mixture. Although that might seem like a lot of different things to prepare for one meal, all four are the sort of thing that are great to make ahead of time and keep in the fridge, mixing and matching with your meals throughout the week for a flavor and nutrient boost. 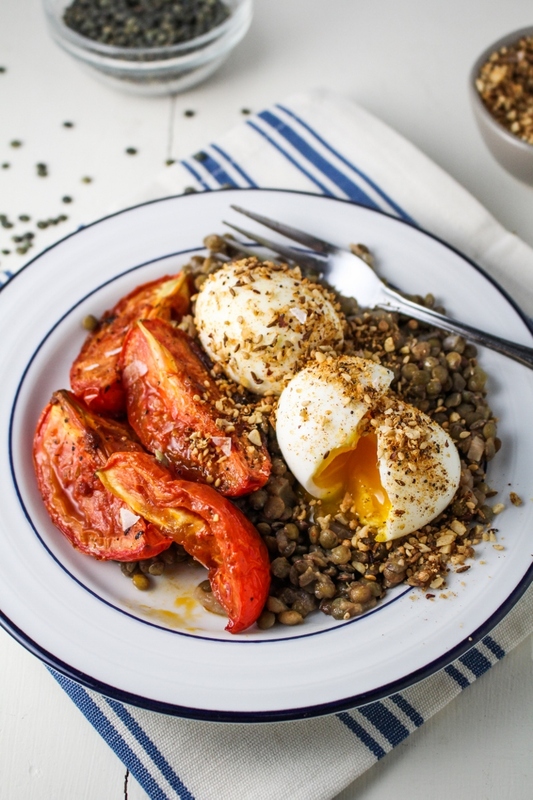 After you’ve tried the combination here, leftover roasted tomatoes can be tossed with pasta, sauteed lentils can be mixed with rice for an easy dinner, soft-boiled eggs can be added to your lunchtime salad, and a sprinkle of dukka is good on everything from scrambled eggs to a snack of hummus and pita. Having this kind of food on hand is exactly how eating healthy can become both easy and delicious. Disclaimer: I received a review copy of A Change of Appetite from Mitchell Beazley, but I was not otherwise compensated and all thought and opinions are my own. Recipe from A Change of Appetite. Serves 6. Heat a dry skillet over medium-high heat. One at a time, toast each of the first 7 ingredients (hazelnuts through cumin) until fragrant, usually about 1-2 minutes, then add to the bowl of a food processor. Once you have toasted all the seeds and spices, pulse in the food processor until coarsely ground. Stir in the paprika and sea salt flakes, then store in an airtight container. You will have more than you need for this recipe. Preheat the oven to 375°F. Stir together the olive oil and harissa, then toss with the tomatoes. Spread on a baking sheet in a single layer, and sprinkle evenly with the sugar, salt, and pepper. Roast for 45 minutes to an hour, or until caramelized in parts and slightly shriveled. Heat 1 TBS of the olive oil in a large saucepan over medium heat. Add the onion, celery, and garlic, and saute until softened but not browned, about 4 minutes. Add the lentils, thyme, and bay leaf and stir to coat with the oil, then add 3 cups of water. Bring the lentils to a boil, then reduce to a simmer and simmer, uncovered for 15-25 minutes, until lentils are tender but not mushy. If any water remains, drain the lentils. Stir in the lemon juice, sherry vinegar, and remaining 4 TBS of olive oil. Taste, and adjust seasoning if necessary. Set aside. While the lentils are cooking, bring a large pot of water to a boil. Carefully add the eggs and boil for 6 minutes, then remove with a slotted spoon and run under cold water until they are cool enough to handle. Peel the eggs and set aside. 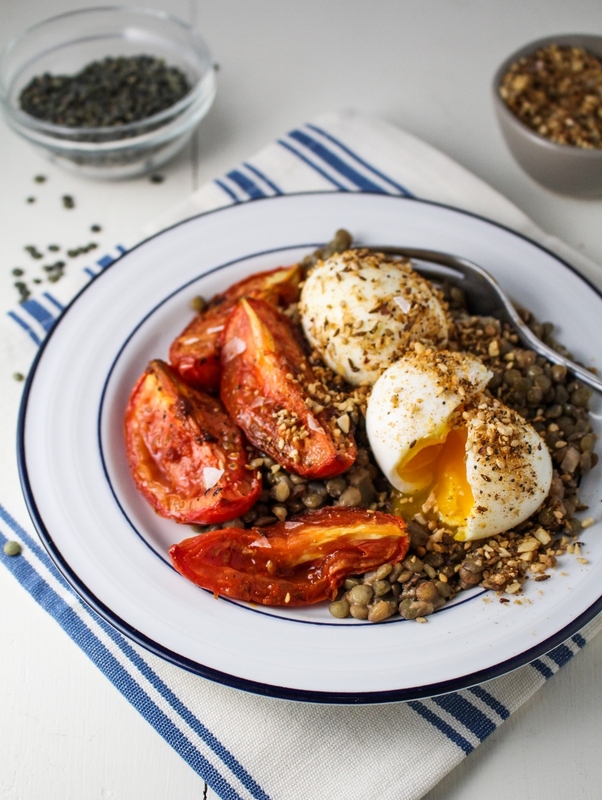 To serve, place a few large spoonfuls of lentils on a plate. Add several tomato slices. Roll an egg in the dukka mixture, and add to the plate. Sprinkle with the chopped cilantro, and serve immediately. 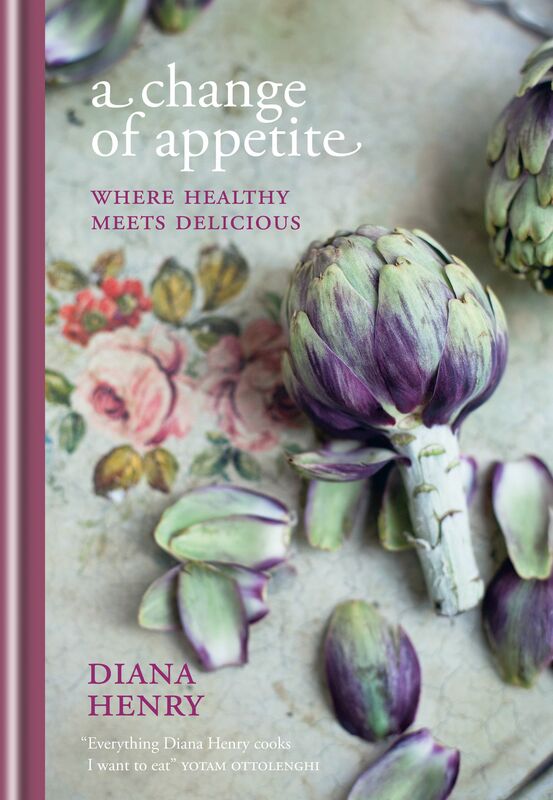 Love Diana Henry’s book – so inspirational and the recipes are gorgeous! definitely a recipe i will be recreating… looks divine! and your eggs look PERFECT. craving this right now. thanks for the awesome recipe and ideas. wow this looks delicious… i will be adding this to my meal planning for the week! i am so glad i stumbled across your blog, i definitely will be returning. thanks for sharing. Haha – I saw this pinned on pinterest, and thought “That looks delicious – like one of Diana Henry’s recipes!” – and lo! It is! Looks fantastic and I am adding this one to my list of things to make from A Change of Appetite. Mmmmm…. I made this for dinner tonight and even my “not-so-keen-on-meatless-meals” husband loved it. Thanks! I love the roasted tomatoes you included in the recipe. Harissa olive oil sounds so delicious! Thank you so much for sharing. Can’t wait to try this at home!